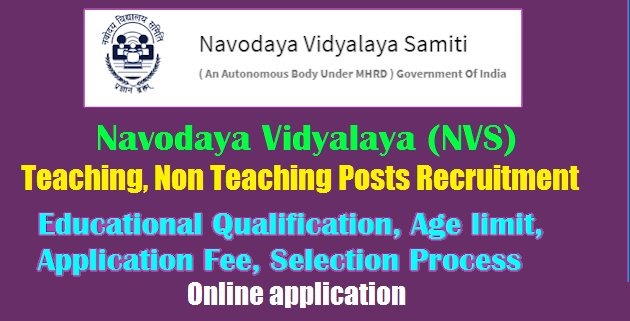 Navodaya Vidyalaya Samiti NVS Recruitment 2019 | 251 Teaching and Non Teaching Posts Apply Online @ nvsrect2019.org Navodaya Vidyalaya Samiti has announced recruitment Notification for 251 vacancies of Non Teaching Staff posts. Last date for NVS 2019 notification is 14/02/2019. Recruitment to the Non-Teaching Posts (Principal , Assistant Commissioner (Administration) , Assistant, Computer Operator, Post Graduate Teachers (PGTs) Posts ). NVS Recruitment 2019 Apply for 251 Teaching & Non Teaching Posts via navodaya.gov.in or nvsrect2019.org. Navodaya Vidyalaya Samiti (NVS) has invited candidates to fill up teaching and non teaching posts. And the other details of this notification like Educational Qualification, Selection Process, and much more are given below and Before going to apply, candidates should read the eligibility criteria in official notification and check whether you are Eligible to Apply these posts or not details, Educational Qualification, Age limit, Application Fee, Selection Process are given below. determine suitability for the job. Principal (Group-A): Master Degree from recognized university with at-least 50% marks in aggregate; B. Ed or equivalent teaching degree. Assistant Commissioner (Administration) (Group-A): Graduate Degree from a recognized University; Holding analogous post on regular basis. Assistant/Computer Operator (Group-C): Degree from a recognized Institution/University; Skill in word-processing & data entry with a one year Computer Diploma from a recognized Institution. Post Graduate Teachers (PGTs) (Group-B): Two Year Integrated Post Graduate Course from Regional College of Education of NCERT in the concerned subject with at least 50% marks in aggregate. Candidates will be shortlisted on the basis of their performance in written examination and interview put together. The Samiti reserves the right to decide the cut off marks in written examination and interview separately. The decision of the Samiti about the mode of selection to the above posts and eligibility conditions of the applicants for interview shall be final and binding. No correspondence will be entertained in this regard. However, in the case of Assistant and Computer Operator, the selection to the post will be done on the basis of the performance of the candidates in the written examination only. However, the mode of selection, whichever so, for all the above posts will be the sole discretion of Navodaya Vidyalaya Samiti and may be changed. The Written Examination for the recruitment to the above mentioned posts is likely to be held at following 42 cities (code of the cities is mentioned against the name of the city). However, the Samiti has the right to conduct the written test at all the cities or any one of the cities depending upon the number of the candidates and other compulsions. Number of centers in each city will depend upon the number of candidates opting for a city. The centre for the written examination for the post of Principal and Assistant Commissioner (Administration) will be at Delhi NCR only. The centres of examination will be decided by NVS though the preferences/options submitted by candidates will be considered to the extent of availability of seats at such centre.